Nothing says "Yum!" on a hot summer day like a big bowl of cold ice cream. 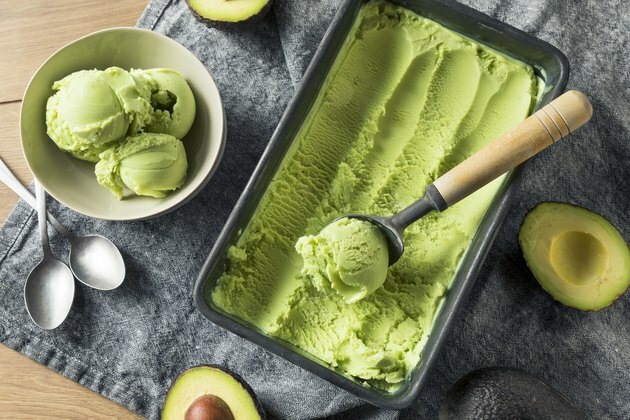 If you're on a ketogenic diet and need to avoid sugars and carbs, while fats are desirable, ice cream can present a bit of a quandary. Its high fat content is definitely a boon, but the sweet treat could kick you out of fat-burning ketosis if it contains a lot of sugar or carbs. Although the cream in ice cream is perfectly OK on a keto diet, sugars and added high-carb ingredients could throw you out of ketosis. The state of ketosis is when your body burns ketones instead of glycogen for its fuel. If that explanation is a little too scientific, it means that your body is using fat — either your body fat or fat from your diet — instead of sugar/carbs. This is good news for dieters who want to lose weight, but it's also a boon for athletes wanting to train their bodies to have long-term steady access to fuel for endurance, diabetics, people with psychological problems such as bipolar disorder or depression, epileptics and more. The keto diet limits carbohydrates to between 20 and 50 grams per day. Protein also gets limited to roughly 1 gram per pound of body weight, because too much protein gets converted to glycogen/sugars. That leaves 75 percent of the diet for fat consumption. Although that might sound a little scary after hearing the medical community tout low fat for the past several decades, recent studies show that eating even liberal quantities of saturated fat have little to no effect on coronary heart disease — and can be helpful for brain health. However, despite the controversy around recent studies appearing to exonerate saturated fat's role in heart disease, the USDA, Health and Human Services, and related governing bodies recommend limiting saturated fat to no more than 10 percent of your daily calories. Consult your doctor before exceeding 10 percent of your diet as saturated fat per the 2015-2020 Dietary Guidelines for Americans. In its purest form, ice cream is made from just a few wholesome ingredients. Heavy whipping cream: This whole-fat ingredient has less than 1 gram of carbohydrate per fluid ounce. It also serves up nearly 11 grams of fat in that amount and under 1 gram of protein, making it a keto snacker's dream ingredient. Milk: Manufactured ice cream usually contains some form of milk. Although most dairy is keto friendly, milk contains 12 grams of sugar per cup and 13 grams of carbohydrates. Whole fat milk also has 8 grams each of fat and protein. When you make your own ice cream at home, adding half-and-half instead of milk for any needed thinning is a much better choice. It has just 3 grams of sugar per 1/2 cup and 3 carbs, while spooning out 10 extra grams of fat. Eggs: Egg yolk is used in French vanilla flavored ice cream to give it a rich, custardy texture. Each egg yolk contains less than a gram of carbohydrate, which is good, and 4.5 grams of fat — even better. If you're concerned about overeating protein, you'll want to note that there are 2.7 grams per yolk and add it to your daily total. Gelatin: Often used as a thickening agent to give ice cream an even creamier texture, unflavored gelatin has few or no carbs and no sugar. There is a negligible amount of fat, but a significant amount of protein — 6 grams per tablespoon in gelatin, roughly the amount found in an egg. No, not the kind of gum you chew up and use to blow bubbles. Various types of gums are used as thickening and stabilizing agents. Some kinds of gum you might see listed in ice cream ingredients include carob bean gum, guar gum, tara gum, xanthan gum and locust bean gum. Known collectively as seed gums, they have about 22 grams of carbohydrate per ounce and the same amount of fiber. If you're counting net carbs, this is good news — the fiber and carbs cancel each other out. However, it could still affect your blood sugar and state of ketosis. Someone with Type 1 diabetes, for example, can experience a rise in blood sugar from the seed gums due to the fiber distending the stomach and triggering a release of hormones. And not all keto experts even agree about counting net carbs as an effective practice for ketosis. Sugar is the main culprit in ice cream that can kick you out of ketogenesis; 1/2 cup of sugar packs a whopping 100 grams of carbs. Whether you're making ice cream at home or buying it at the store, there are some sweeteners that can make the cold confection a keto-friendly sweet treat. Erithrytol is a zero-calorie sweetener that can actually block glucose absorption according to a 2018 study by the University of KwaZulu-Natal. It also helped the muscles better utilize glucose and increased glucose tolerance in diabetic rats. Other non-nutritive sweeteners, such as stevia leaf, monk fruit and aspartame, can provide sweetness without affecting glucose levels, says a 2017 study by the National University of Singapore. Sugar alcohols such as xylitol and mannitol are very low carb; however, they do trigger a blood glucose-insulin response, making them inappropriate for diabetics and potentially interrupting your ketosis. No matter which ice cream store you visit, you're going to be spending a significant part — or possibly all — of your allotted carbs for the day. However, for the occasional treat, there are plenty of ways to indulge your taste for cool, creamy goodness, provided you're willing to stick to a child-sized portion. Baskin Robbins rolls out three flavors with less than 20 grams for the small 2.5-ounce size. Chocolate Chip delivers just 14 grams of carbs, making it the clear winner at the famous ice cream shop. Cherries Jubilee serves up 17 grams for the small size, and Chocolate Chip Cookie Dough has 20. At Cold Stone Creamery, on the other hand, the Eggnog ice cream has 17 grams of carbs, as does Chocolate; Pina Colada has 20 grams. There are quite a few choices with 21 grams, including Amaretto, Banana, Chocolate-Dipped Strawberry, Dark Chocolate Peppermint, Irish Cream, Mango, Mocha, Pumpkin and Skinny Vanilla. There's no need to go to specialty stores to get ice cream that's low in sugar and easy on carbs. National chains like Safeway, Whole Foods and Walmart carry low-carb ice cream. Enlightened ice cream uses monk fruit and erythritol to pull off a significant part of the sweetening effect in its take-home flavors. There are usually only about 6 grams of sugar and 6 to 7 grams of fiber to offset a 1/2 cup serving's 17 to 24 grams of carbs. Ice cream bars have even less. But beware — binge-worthy flavors like Snickerdoodle, Birthday Cake and Frozen Hot Cocoa might tempt you to sneak back for second helpings. Breyer's CarbSmart comes in two flavors: Chocolate and Vanilla. Each has 12 grams of carbs, 3 grams of which are sugar. Breyer's also makes CarbSmart ice cream bars with flavors that include the Smooth Mint Bar, chocolate-covered Vanilla Bar, Almond Bar and Fudge Bar. Turkey Hill: How Many Ingredients Are in Your Natural Ice Cream? Mental Floss: What's the Difference Between Vanilla and French Vanilla Ice Cream? Diet Doctor: What Are Net Carbs?